Students from across the country travelled to our Guildford and Manchester offices to take part in the next stage of their AQA Unlocking Potential journeys. 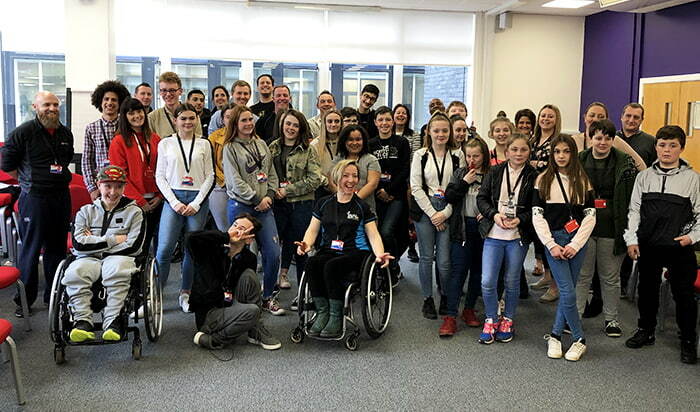 AQA Unlocking Potential is the mentoring programme we run with the Dame Kelly Holmes Trust, and the students and teachers were joined by their Dame Kelly Holmes Trust mentors and AQA staff volunteers. They took part in team-building and problem-solving activities. Later on, they worked with the mentors to finalise their plans for a social action project – every young person who takes part in AQA Unlocking Potential gets the chance to deliver one. They prepared for the then deliver pitches to a Dragon’s Den-style panel to apply for funding. Ideas included support for students dealing with exam stress, a boccia tournament and a body positivity awareness day. The students on the programme will now focus on delivering their social action projects in their communities, over the next few months, with the support of their mentors.